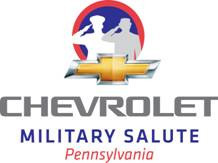 As part of its longstanding commitment to the military, Chevrolet is proud to announce the Chevrolet Military Salute in Pennsylvania – a program that encourages people to nominate active duty Pennsylvania military servicemen and women who they’d like to honor, for the chance to win a Chevy-style celebration in their hometown. Nominations will be accepted from August 22 to September 23 on the General Motors’ GMNortheast blog, www.drivingthenortheast.com. Five finalists will be selected from the entries received and profiled on the blog. People will then be able to show support for their favorite finalist by casting their votes online. In October, the Chevrolet team will roll into the chosen serviceman or woman’s hometown for a celebration they’ll never forget. For your chance to nominate a loved one or vote visit, www.drivingthenortheast.com. Chevrolet’s commitment to the U.S. military runs deep. Its relationship with the military began in April 1940 when Chevrolet negotiated their first military contact building explosive shells. By the end of 1941, military trucks and aircraft engines were also being produced in Chevrolet plants. Seven Chevrolet plants across the country were awarded the Army-Navy “E” for excellence, in recognition of their contributions to wartime production. Chevrolet Military Salute was launched to recognize and honor the sacrifices of men and women for their country, extending the brand’s support of the military. This support includes other programs such as Chevrolet’s military discount, ongoing collections for Cell Phones for Soldiers, and partnerships with military organizations like the Achilles Freedom Team and the Travis Manion Foundation.